Ah Tostino’s Pizza Rolls, how delicious you are. I have many memories of popping these little pizza bites into the oven at friends’ houses after school and devouring them while doing homework, watching Full House, or chatting on AIM. If you were in grade school in the early 90s, perhaps you did the same thing. I was inspired to recreate this classic after school snack the other day when I purchased a package of wonton wrappers on a whim. I was craving pizza but didn’t have enough ingredients on hand to make an entire pie. This is where the wonton wrapper come in. Why not make pizza bites? Why not recreate Tostino’s Pizza Rolls?? 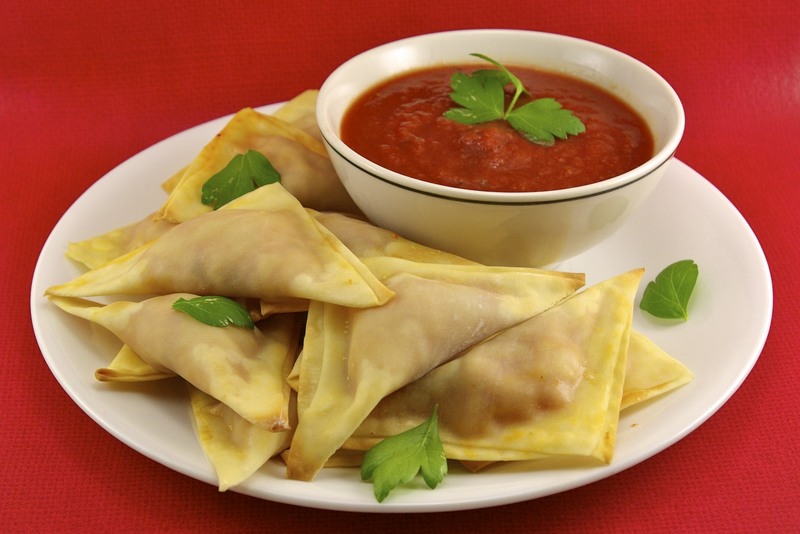 Filled with mozzarella cheese, turkey pepperoni, and flavorful marinara sauce, and then wrapped up in a crispy outer shell, these little bites are a pizza lover’s dream, in miniature form. What’s more, the recipe is completely flexible! Craving buffalo chicken? Try using cooked shredded chicken, blue cheese, and hot sauce. Thinking about BBQ chicken pizza? Why not use shredded chicken, BBQ sauce, and mozzarella as your filling? You could easily make this vegetarian as well by incorporating your own favorite pizza ingredients with the cheese and marinara sauce. The options are really endless. Get your kids in the kitchen to help you and you’ll have a blast! What is your favorite pizza? Do you remember eating Tostino’s a child? Let me know below! In a medium bowl mix together mozzarella and parmesan cheese, 1/2 cup marinara sauce, quartered pepperoni slices, garlic powder and oregano. Remove one wonton wrapper from the packaging (keep the others in the pack so they stay moist). Drop a rounded teaspoon of pizza filling into the center of the wrapper. Be careful not to over fill, as it will run out the sides! Dampen your finger in the bowl of water and run it alongside the edges of the wrapper. Fold wrapper over to make a triangle, pushing out any excess air, and press firmly to seal together. Spray pizza rolls with cooking spray or brush lightly with a little olive oil. Place rolls in oven for 9-10 minutes or until lightly brown. Meanwhile heat extra marinara in the microwave and serve alongside your pizza rolls. I loved when my mom made these as an after school snack! Great idea with the homemade – and wonton wrappers! Why don't I use them more?! Thanks Laura! I am just discovering the wonder of wonton wrappers. I made some pumpkin raviolis out of them the other day and they were delish!